Slip and fall is a legal term used to describe when a person slips, trips, or falls on another person’s property. 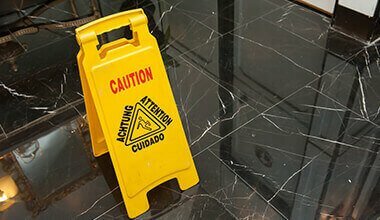 Slip and fall claims fit under a broader category, premises liability, wherein a property owner may be held responsible for the injuries a person suffered while on the owner’s premises. If you were injured in a slip and fall, you may be entitled to file a claim for damages, including current and future medical costs, and lost wages, as well as pain and suffering. Contact South Florida slip and fall attorney Justin Weinstein to get the help you need to recover compensation. With complete knowledge of premises liability laws and an impressive track record of success, he is ready to help you. Fill out our contact form to schedule your free consultation. Slip and fall accidents can occur for a number of reasons. Sometimes, a person may quickly slip and resume their balance before falling. These dangerous conditions can contribute to causing a fall. Property owners are expected to correct dangerous conditions or warn visitors of these conditions, such as setting out a caution sign when floors are wet. Though anyone can be injured in a slip and fall, seniors and young children are more susceptible to serious injuries. According to the Centers for Disease Control and Prevention, 1 out of 5 falls cause a serious injury among Americans over the age of 65. In a slip and fall case, courts may find the property owner liable if they created the situation that led to the accident or knew about the dangerous condition and failed to repair it. In some cases, they may still find the property owner responsible if they did not know about the dangerous condition, but the condition had existed on the property for an extended period of time and the owner should have known about it. Under the law, both public and private property owners must keep their properties safe. These types of claims may be filed against homeowners, stores, restaurants and even government entities. Slip and fall cases can be very complex, which is why it is important to contact a slip and fall lawyer. When you contact South Florida slip and fall lawyer Justin Weinstein, he will get to work on your claim right away. A slip and fall lawyer will gather all the facts of your slip and fall accident, contact witnesses, obtain security video footage if available, gather your medical documents, and establish that the property owner knew or should have known of the hazard. As a personal injury lawyer, Justin Weinstein will fight for your rights and help you obtain the compensation you deserve. For a free case review, fill out our contact form or call 954-845-0505 – we’ll always take your call.